Adam Bray writes a lot of books. He is the author of the first comprehensive licensed reference books for the Marvel Cinematic universe, including the Marvel Studios Visual Dictionary, the Marvel Studios Character Encyclopedia and Marvel Studios 101. Adam is also a co-author of the cornerstone reference books for Marvel Comics, including the flagship Marvel Encyclopedia (with a forward written by the late, great Stan Lee), Ultimate Marvel, and Marvel: Absolutely Everything You Need to Know. Fortunately Adam is a life-long Star Wars fan, because he's written even more Star Wars books than Marvel. Adam is the author of the official guides to Disney XD’s Star Wars Rebels animated TV series (with a forward written by Executive Producer Dave Filoni--seen in the lower right photo--and interview exerpts with Simon Kinberg, producer of the X-Men and Deadpool movies). 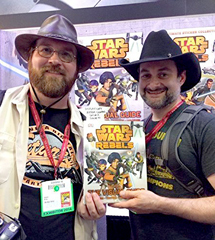 Adam has also co-authored the reference books that define Star Wars canon, including Ultimate Star Wars (with a forward written by actor Anthony Daniels, aka C-3PO), the Star Wars Visual Encyclopedia and Star Wars: Absolutely Everything You Need to Know (Nominated for a Nickelodeon Kids’ Choice Award). He is also the co-author of Stormtroopers: Beyond the Armor (with a forward by actor John Boyega, aka “Finn”), the definitive filmmaking history of the Empire’s iconic soldiers, from the earliest appearances of stormtroopers in marketing of the original Star Wars: A New Hope (1977), through merchandising, publishing, games, animation, the 501st Legion, and though seven more live-action films, including Star Wars: The Last Jedi (2017). The book features interviews with lots of Star Wars creative talanet, including actors Sam Witwer (Darth Maul, Starkiller) & Dee Bradley Baker (Captain Rex and all the clone troopers), artists Kilian Plunkett, Terryl Whitlatch and many others. And speaking of stormtroopers, Adam is also proud to be an honorary member of the 501st Legion. Adam Bray is a life-long fan of LEGO and proud do be associated with their brand. Adam’s LEGO books include DK’s LEGO Star Wars: Into Battle! and LEGO Star Wars: Chronicles of the Force (featuring an exclusive LEGO minifigure from The Force Awakens). Publicity appearances are a big part of Adam's work. He has survived four national book tours, stopping at around 45 cities to promote his Star Wars and Marvel books. He has appeared as a featured guest, panelist and autographer at Star Wars Celebration (Anaheim, London and Orlando), San Diego Comic-Con (2014, 2015, 2018), New York Comic-Con (2015, 2016, 2017, 2018), C2E2 in Chicago (2016) and Fan Expo Vancouver (2018). He also appeared on the Emmy-Nominated “The Star Wars Show” (see the video below). Adam has written numerous articles for StarWars.com and has also been interviewed many times for StarWars.com and Star Wars Insider (the official magazine). His books have been advertised on billboards in Times Square in Manhattan and inside issues of Marvel Comics too. INTERVIEWS & APPEARANCES: To requent an interview or if you would like to bring Adam to your convention, please contact Adam using the email listed at the top of the page. HIRE ME! Are you a publisher? I am happy to discuss book projects and other assignments pertaining to movies, television/streaming series, comic books, video games and other pop-culture properties. Do you need someone to document the making of your film? I'm available! Please contact me at the email address listed at the top of the page to discuss your project. BUY MY BOOKS! The best way to support me as an author is to buy my books directly from me. To purchase SIGNED books, please email me (my email address is listed at the top of this page) with a list of books for a price quote. In most cases I can only mail books within the USA, unless you are willing to cover the additional overseas shipping costs. The second-best way to support me is to order my books on Amazon using links from this website, which supposedly provide me with an excrutiatingly tiny, itsy-bitsy, seemingly-negligable referral fee. co-authored with Ryder Windham and published by HarperCollins. at Celebration Europe in London (2016) to discuss Star Wars: Absolutely Everything You Need to Know. prior to release of The Hobbit: An Unexpeted Journey (2012). 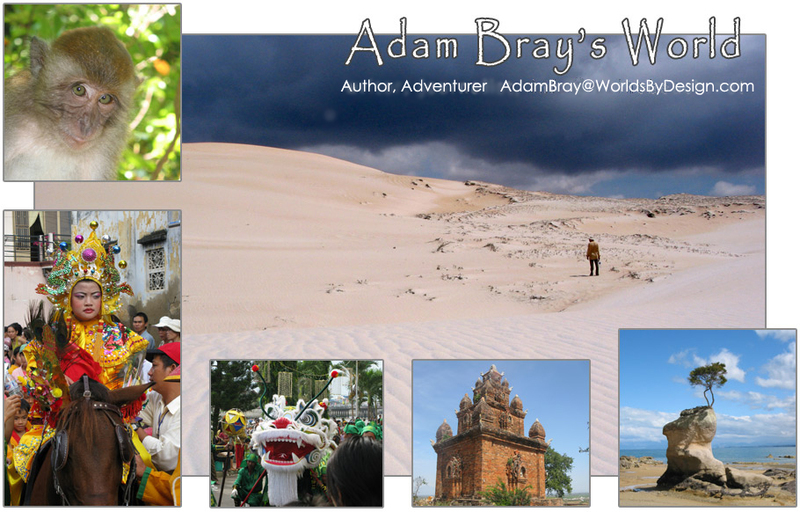 Prior to writing Star Wars and Marvel books, Adam Bray wrote travel guides and was based in Southeast Asia. Adam lived in Vietnam for a total of 7 years, worked a year in Cambodia, and spent considerable time exploring China, Thailand and Laos. Afterwards he spent a lengthy series of stints in New Zealand too. He has contributed to around 40 travel guides on Southeast Asia for publishers such as Insight Guides, DK Eyewitness Travel, TimeOut, Thomas Cook, Berlitz and Footprint. Adam has also written travel articles for media outlets such as CNN, National Geographic and the SYFY Channel. Many of Adam's books and articles also feature his own comissioned photography. 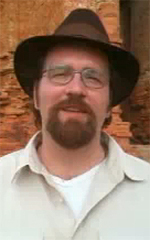 Adam was the first journalist to visit the recently-discovered “Long Wall of Quang Ngai” (an ancient wall with a similar local significance to Hadrian’s Wall in the UK) and document it for international news media outlets such as CNN and BBC Travel. 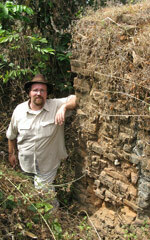 Adam spent most of his free time exploring the countryside, and in the process discovered several undocumented ancient temple ruins from the Kingdom of Champa. He spent a great deal of time in local Cham villages, learned to read their ancient language (an offshoot of ancient Sanskrit) and even wrote about the Cham for National Geographic. Adam has an old blog at The Fish Egg Tree documenting his adventures overseas (please note, this blog is no longer updated). 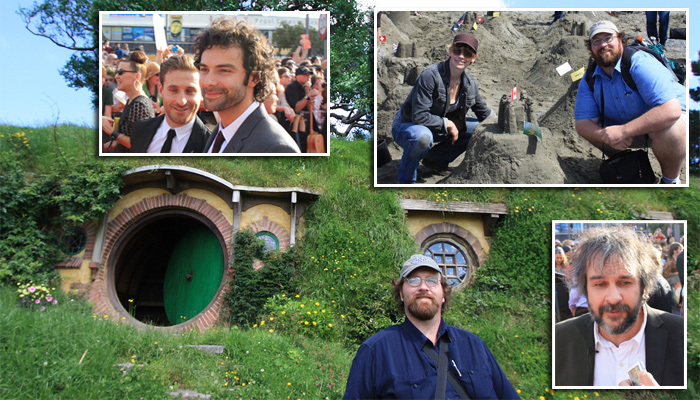 During his time in New Zealand, Adam covered the Red Carpet World Premiere of The Hobbit: An Unexpected Journey in Wellington, and as a result he can be spotted in several versions of the official behind-the-scenes Hobbit blu-rays. Adam's television experience includes: appearing as a guest on CNN International; consulting for "Kenny & Zoltan's Venom Quest" (National Geographic); consultant, location & talent scout for "Gordon's Great Escape" (Gordon Ramsay); and consulting for "Scam City" (National Geographic). HIRE ME! Are you with a travel publisher? Adam is available for international assignments as a writer/researcher and photographer. Are you planning to film on location in Southeast Asia or New Zealand? Adam is available as a consultant and location scout. Please contact Adam at the email address show at the top of this page to discuss your needs. The image above includes a photo taken on a media trip to Rwanda as a guest of the government. 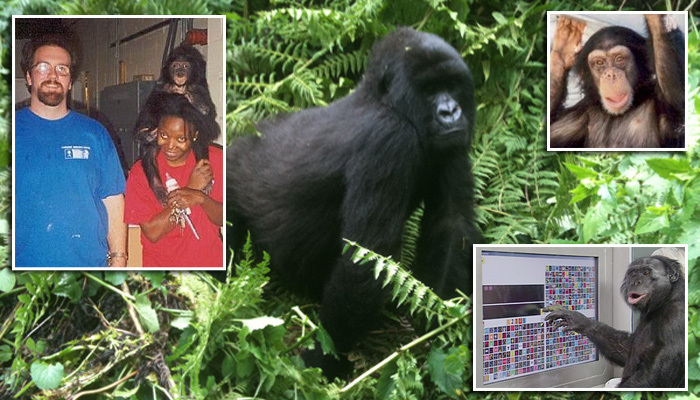 The mountain gorilla was photographed on an iPhone3--without a zoom feature! At the far left is Adam and a co-worker holding a baby bonobo. The upper right is a chimpanzee Adam once cared for. The lower-right corner is Kanzi the bonobo, an ape whoe was once under the care of Adam Bray. Adam Bray was born in a small New England fishing village. He is the grandson of Dr. David Livingston, a noted Archaeologist who spent 3 decades excavating the ancient Biblical city of Ai in Israel (Adam accompanied him on one of the last digs). In the 1980s, Adam's family bought a school bus and drove to Alaska, where they lived for two years (6 months of that was actually spent living in the bus during the winter). Adam grew up there and then in Arizona, Pennsylvania, New England and Florida. He graduated from Covenant College, located atop Lookout Mountain, which overlooks Chattanooga, Tennessee. The main college building was a former prohibition-era hotel and casino with a colorful past. Its isolated, atmospheric setting was even considered as a shooting location for The Shining (1980). The mountain is riddled with caves, and during his time there, Adam spent many weekends spelunking. Adam Bray interned nearby at the Chattanooga Nature Center (now the Reflection Riding Arboretum & Nature Center) as a wildlife rehabilitator and worked hands-on with raptors (owls, kestrels, hawks, and vultures) and their highly-endangered Red Wolves. Adam went on to work as an instructor in educational programs at both the Phoenix Zoo and Zoo Atlanta. Adam Bray has extensive experience with primates--including working hands-on with three of the four great apes (common chimpanzees, bonobos and orangutans). Adam spent a couple of years caring for around 80 chimps at the former Primate Foundation of Arizona. Later he wrote about the journey of one of the chimpanzees--a chimp named Kobi who was sent there by Jane Goodall--for National Geographic. Adam went on to work with an orangutan and several bonobos (pygmy chimpanzees), including a very famous bonobo named Kanzi, who uses a keyboard to communicate with humans and other apes. Kanzi has been featured in print and television documentaries around the world (and if you look very closely, you might spot Adam in the background of one or more). Contact Adam: See my email address at the top of the page or contact me through Facebook or Twitter.